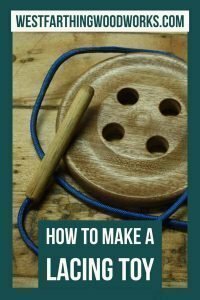 How to make a handmade lacing toy tutorial is step by step instructions for making a lacing toy on the lathe. 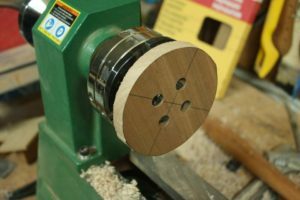 You can do the same process without the lathe and just sand it by hand, or you can use the lathe to profile the shape a little easier. Here is the tutorial. Kids love lacing toys. Maybe it’s because they like using their hands, or they like putting the string through the holes. Maybe they just like wooden toys that make them use their imaginations. Either way, it’s fun to make something that kids love to play with. This handmade lacing toy is no exception. 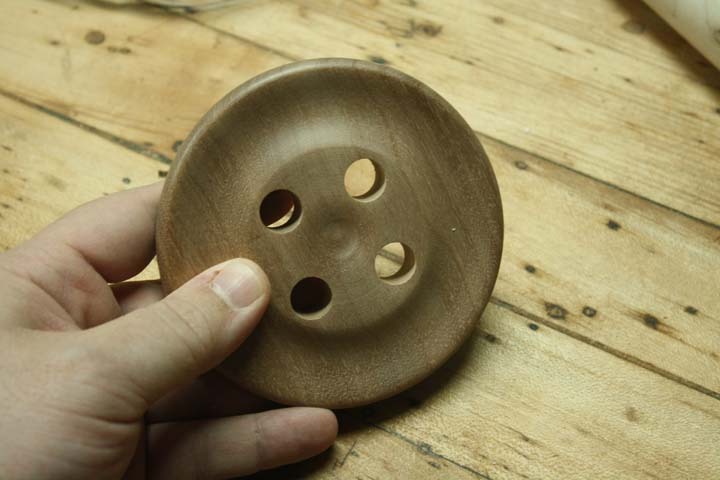 After looking around at several, I decided to make an old fashioned button with four holes. 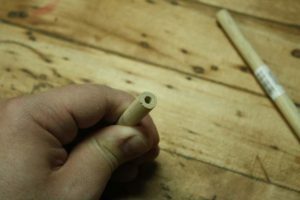 This is a shape that you can make on the lathe really easily, but you can also sand something similar by hand if you do not have a lathe. Feel free to modify the design to whatever shape and style you prefer. 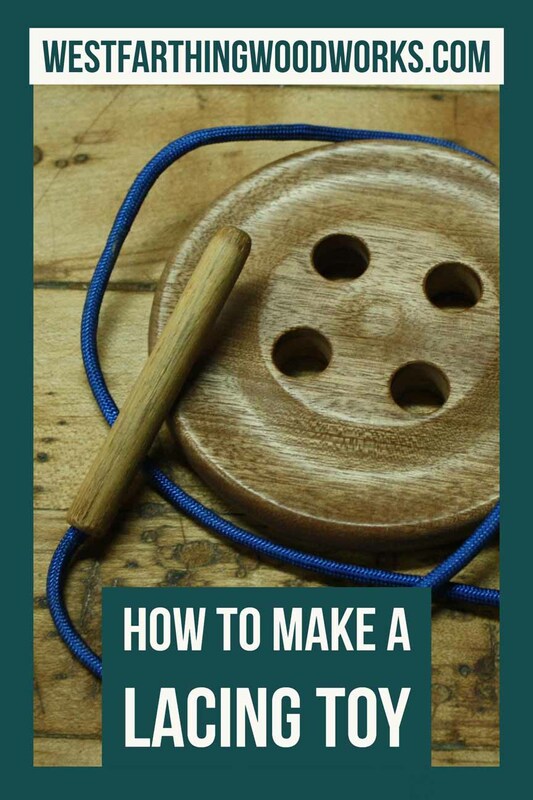 The instructions for creating a simple four hole lacing toy that follow will still work. 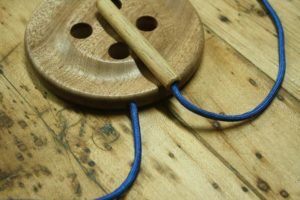 This tutorial shows you how to create the shape, drill the holes, and attach the string to the button and wooden needle. Please enjoy the tutorial, and I hope this toy will help you and a child make wonderful memories. Lastly, consider the age of the recipient before making this toy for a child. My son doesn’t eat his toys anymore, so I feel comfortable making this for him. The toy has smaller parts and string, so please make sure to always supervise children at play. The first step in making the button is to decide on a species of wood. In this case I chose Spanish Cedar, since my son no longer eats his toys. If he still stuck things in his mouth on occasion, I would have gone with Maple. My board is 1/2 inch thick for reference. Mark out a circle that is 4 inches in diameter. Then, mark an X through the center of the circle, which you can do by lining up your ruler with the center point from the compass. A line going through that point will cut the circle in half. Mark the next line through the center too, but at 90 degrees from the first line. This will give you a perfect X. Now, measure 3/4 inches from the center of the X on all four lines, and make marks on the legs of the X. Once you have your shape and the holes marked out, trim the shape of the lacing toy on a band saw or by hand with a coping saw. 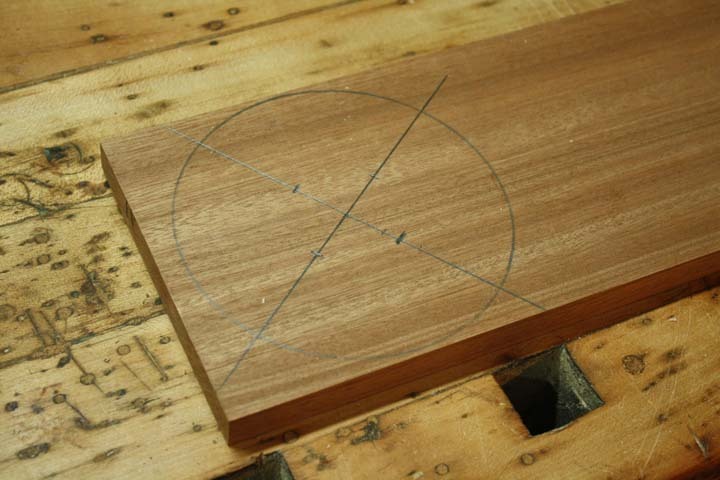 Then, using a drill press and a 1/2 inch drill bit, drill through the marks you made earlier for the holes. When drilling on the drill press, be sure that you use another piece of wood under the lacing button to protect it. When the drill exits the button, it will blow out the rear side without something behind it. This needs to be a scrap that you don’t care about, since it will have random holes drilled in it. This part of the tutorial is optional, but does speed up the process and open up some design opportunities that are really difficult to do by hand. 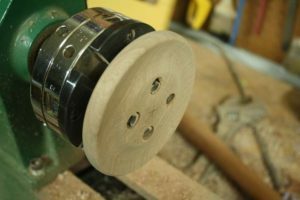 If you are going to perform the shaping without a lathe, then you can make a beautiful button as well. Simply taper both faces towards the rim on the front and back. Use a sander if you can to help you remove material. Then, sand by hand to remove any scratches. Once you have a nice tapered shape, which is common in old fashioned buttons, then you are ready to move on to the part where you finish the toy and attach the string. 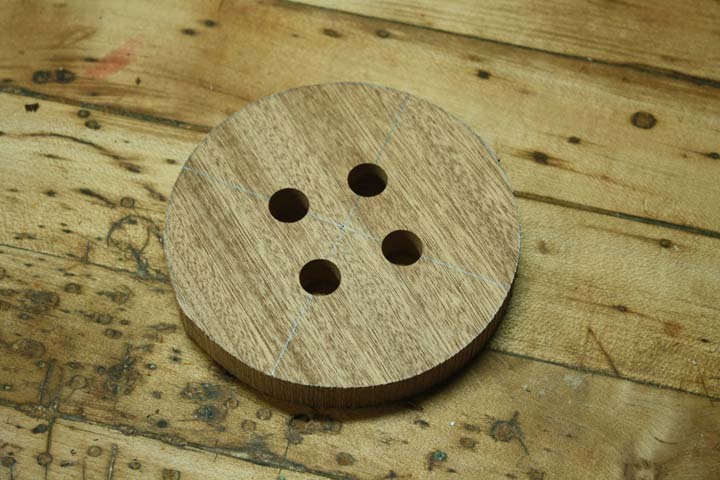 For those of you working on the lathe, you can create a classic button style too. Simply dish the outer area from the outsides of the lacing holes to the rim. 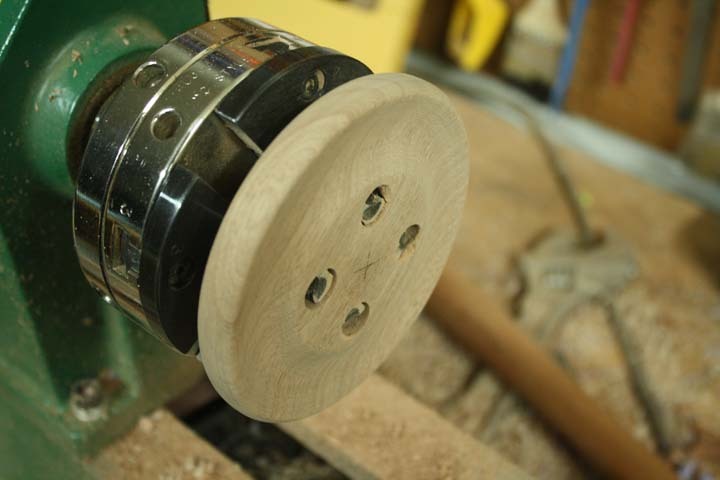 Use a round carbide tool or a bowl gouge to remove the material. Be sure not to go too far into the surface, no more than half way. The goal is to give the lacing toy the look of an old fashioned shirt button. You can also dish the very center just a bit, to give it a bit more flow from the holes to the center. The design choices are up to you. If you see a button that you really like, then feel free to copy that design on your lacing toy. Finishing the button toy depends on the final user. Younger kids like to stick things in their mouths, so think about that when choosing a finish. If you are making this for someone that still likes to lick their toys, look for a food safe finish like Mineral Oil. There are a number of homemade finishes that are made from Mineral Oil and Beeswax that are great for kids toys. For kids that aren’t going to lick their toys, like my son, hopefully, I decided to buff the wood on my buffing setup. This is a really quick way to finish smaller projects, and I outline the entire process in How to Buff Wood, which I recommend to anyone. 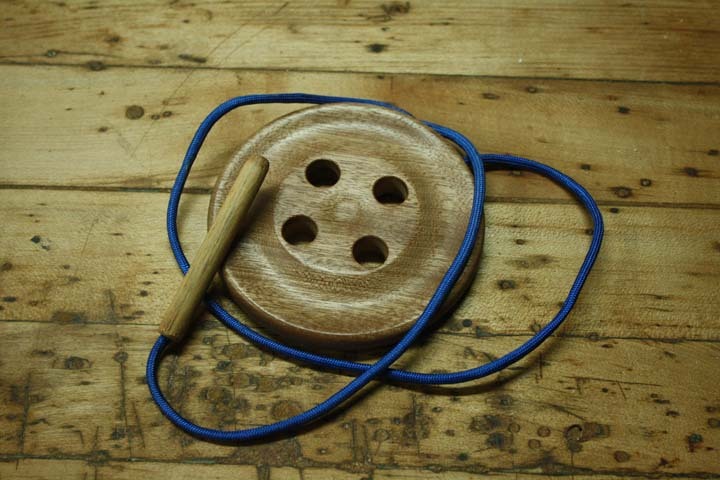 Once your button is done for the lacing toy, you need a needle. The easiest way to make yours is by using a dowel rod. An important consideration is the thickness of the dowel. You want something that little fingers can grip well, but that can also go through the same hole several times without jamming up. On my lacing toy, the dowel is 3/8 inch, and I can get four thicknesses of the cord through the same hole and still pass the wooden needle afterward. I recommend that you not go any larger than that, and no smaller than 1/4 inch for your wooden needle. Once you have your dowel, cut a piece that is 3 inches long. Then, take it to the sander and round the tip really well. Sand the body by hand if needed, and flatten the bottom end. Find a drill that takes out at least 1/8 inch of width, and drill about 1 inch into the end. Use a vise or something sturdy to hold the wooden needle and you can do this by hand. The important thing is to make a deep cavity that you can pack the cord into with epoxy. That will secure it, and will ensure that the kids that are playing with the toy cannot pull it loose. After drilling, sand the needle and round over any sharp corners. Drill the same hole in the rim of the button. Pick a spot under one of the center holes, and drill right through from the outside. Imagine if the button were a tire and you were drilling through the tread. Be careful not to drill into the dished area that you created on the lathe. For this button, I bought some 550 cord from a store. I don’t think it’s real 550 cord, but probably just the kind that people make bracelets from. Either way, it’s strong, and I liked the color. The best way to secure the cord is to use some two part epoxy and pack the ends of the cord into the button and the needle. Cut a piece of cord that is 28 inches long. Fuse the ends with a lighter, which will make then easier to pack into the holes. Get a pick tool or a toothpick and practice jamming the string into the holes. I promise, if you skip this step you will regret it. It’s not hard after a couple practice runs without the adhesive. The cord likes to bunch up, so it can be a challenge the first time. Mix up a small batch of two part epoxy. If you are brave, and your cord packing skills are good, you can use five minute. For everyone else I recommend 60 minute, which will give you some time to factor in any surprises. Drip some epoxy into the hole on the needle first, and use a toothpick to spread it all around the walls of the hole. Then, pack an inch of the cord inside, making sure it’s coated well. Now, do the same thing for the button. Drip the epoxy, coat it well, then pack in the cord with a good coating. Wipe off any excess that may have worked loose from the holes, and then set the lacing toy aside to cure. I really love this little toy, and I hope that my son loves it when he opens it up for Christmas. Last year I made him a wooden train set, and I beat a talking Elmo doll and a red Cozy Coupe for the present he played with the most. It was a proud moment as a woodworker and a father. This little lacing toy is going to be a family treasure for a very long time. It’s a timeless toy, and it teaches kids how to use their hands. 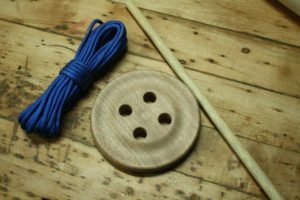 There are tons of different button styles that you can make, and all you have to do is look online. There are also different shapes that you can make too. Look around and find some other shapes if you really like making this lacing toy. You can use the same instructions and just modify them to create any of the styles that you find online. 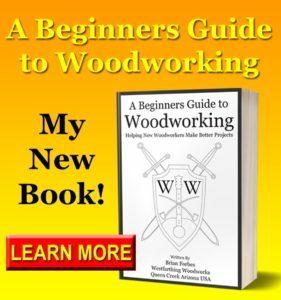 This is a really easy woodworking project, so you can make several of them pretty quickly. If you have any questions on How to Make Handmade Lacing Toy Tutorial, please leave a comment and I will be glad to answer them. Happy building.